Used 2014 Ford F-250 SD Sold in Houston TX 77063 Everest Motors Inc. PLEASE CALL ONE OF OUR SALES ASSOCIATES AT (281) 888-2872 FOR PERSONAL ASSISTANCE AND TO GET MORE INFORMATION ABOUT THIS VEHICLE. WE ARE LOCATED AT 3230 JEANETTA ST HOUSTON TX 77063 ****ALL OUR VEHICLES ARE UNTOUCHED BY RECENT HURRICANE. 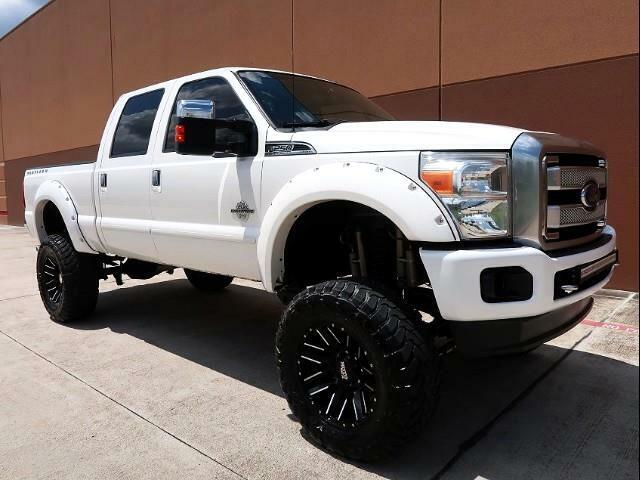 WE GUARANTEE NO FLOOD OR ANY STORIES BEHIND OUR VEHICLES****You are Looking at a very powerful One Owner Great Condition Texan Rust Free 2014 Ford F-250 PlatinumSuper Duty 4X4 Crew Cab 6.7L Power Stroke DieselShort Bed. This 4X4 truck has all the standard equipment and more: Automatic Transmission 6.7L V8 Diesel Engine Air Conditioning Dual Climate Control Electronic Locking Axle Platinum Package Back Up Camera Traction Control Professional 8 inch Lift Kit Factory Navigation System Cruise Control Power MoonRoof Center Console Back Up Sensors Driver Memory Seat Premium AM/FM/XM CD/DVD Player W/MP3 W/AUX Input W/USB W/Audio Steering Wheel Control Microsoft SYNC System (Bluetooth) Power Rear Sliding Window Rear Window Defroster Factory Brake Controller Tailgate Step Hill Descent Control Garage Door Opener Adjustable Power Pedals Premium Moto Metal 20" Wheels Power Outlet Heated & Cooling Front Seats Park Distance Control Power Scope Folding Trailer Tow Heated Mirrors Remote Vehicle Start Dual Front Airbag Restraints Intermittent Wipers Dual Power Front Seats Power Door locks LED Fog Lights Power Windows AMP Power Step Power Brakes Four Wheel Drive Rear Arm Rest Four Matching 35X12.50R20LT Tires in Great Shape and Much More... This Beautiful and sharp looking truck is in Great condition inside and outside with Automatic transmission and 6.7L V8 Diesel engine Designed engineered and built by Ford making it the best in its class. It also gives you best-in-class horsepower and torque. So you can tow a train with this 4X4 truck!!! These trucks have the most towing capacity! This 4X4 Ford is ready to rock the world. Engine runs very strong with no blow by or smoke!!!! Transmission is in excellent performing condition! Turbo boosts are very strong and pulls this heavy truck amazingly! There is no fluid leaks at all! Underneath this 4X4 truck is dry and Texan Rust Free! Suspension is tight as it should be and it does not make any noise at all!! This nice 4X4 truck rides and drives Great!!! All the power equipment and gauges work great.Exterior color is in Great condition with no major ding dent or scratches However you might find some super minor scratches here and there. Very light rock chips around the truck (Pictured). This 4X4looks drives and feels Great! Interior as shown in the pictures is in Great condition with no sign of abuse! Everything looks fresh and clean inside of this nice truck there is absolutely no scratch tear or wear anywhere!!! Leather seats headliner and door panels look Great! Carpet has no stain and it is super clean! Four Matching 35X12.50R20LT Tires in Great Shape.This nice truck comes with One Key/Remote Combo Owner's Manual! Don't miss the chance to own this beautiful super duty truck.All our vehicles are soldAS ISwith no warranty.